Starting a side hustle is a great way to use your free time to help you earn some extra money. After all, nearly everyone could use some extra money coming in every month, unless you’re Warren Buffet or Donald Trump maybe. 😉 But for the rest of us common folk, side hustle money can be a blessing in helping us reach our financial goals. The key is to use the money productively. 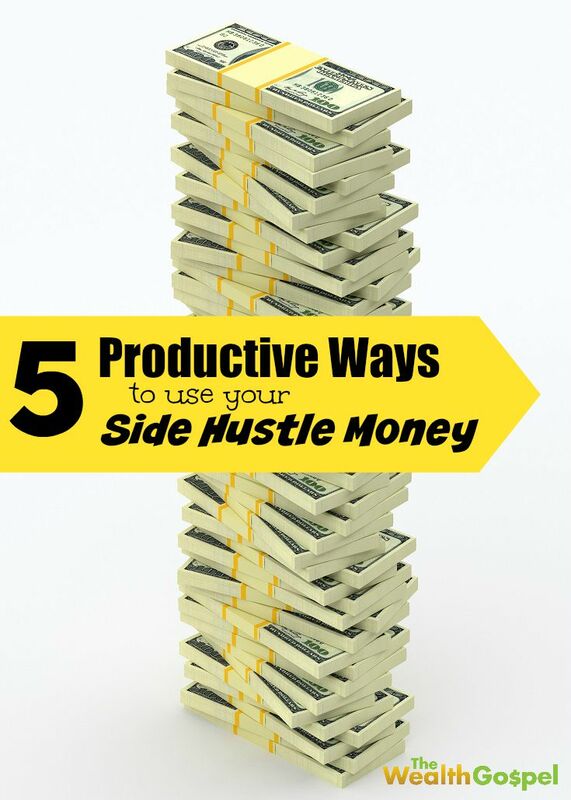 Here are 5 productive ways you can use your side hustle money. One of the best things to do with your side hustle money may also be of the most boring – start or continue building an emergency fund. The whole point of an emergency fund is to have money that is easily accessible if you would ever need it for an emergency, like an injury or a natural disaster. It can be difficult to want to build an emergency fund because chances are you won’t use that money very often and it’s hard to look it just sitting in your account. Rather than take money from your regular monthly budget, you could instead use your side hustle money to add to your emergency fund. To me, paying off debt is a little more exciting than building an emergency fund. I like to see my progress bars and charts fill up and I like knowing that I owe less interest this month than in previous months. You should definitely make sure your minimum debt payments are part of your regular monthly budget, but you could always use some of your side hustle money to make extra payments on your debt too. Much like saving for retirement, using your side hustle money to save for a large purchase, like a car or a down payment on a new house, is definitely more fun than building an emergency fund. Another bonus of using side hustle money to save for a large purchase is that you are helping your future-self avoid taking on debt for this planned purchase. Before you think I’m crazy, hear me out. Taking a vacation and getting away from the daily grind every now and then is a great idea to help you avoid losing productivity and experiencing burn out. Using your side hustle money to take a vacation is a great way to reward yourself for hard work, as long as you truly can afford it. Plus you’ll be able to relax on your vacation knowing that you won’t have a credit card bill to face for your trip when you get back home. What other productive ways can you think of to use your side hustle money? Great list! Once I was making enough to cover our monthly expenses, we applied it towards savings, then a small debt for a minute (it disappeared fast with hustling!) And now house savings. So we’re pretty much on par with your ideas! That’s great Femme! When I was side hustling along with my FT job, I tried to use most of it for debt payments. Now that my former side hustle is my job, I am hoping to increase my earnings so I can continue making extra debt payments.